You may think you know all the fashion essentials a French girl's wardrobe relies on, but there's an outside chance you don't. Why? It can be all too easy to pigeonhole a nation's "uniform" when it's commonly referenced, so we wanted to go back to basics and revisit the concept. What is the actual concise list of items that the world's chicest women follow? Maje's creative director, Judith Milgrom, was on board to enlighten us on the mystical ways of a French girl's edit. Her brand has just launched a denim capsule collection (and it has all the patchworked pieces you'll want right now), but what are the staple jeans Parisians wear on repeat? And what do they wear them with? Questions, questions. Judith has the answers. Keep reading to find out about the 10 French fashion essentials everyone should consider. Of course, we're not talking about any ordinary blazer here. 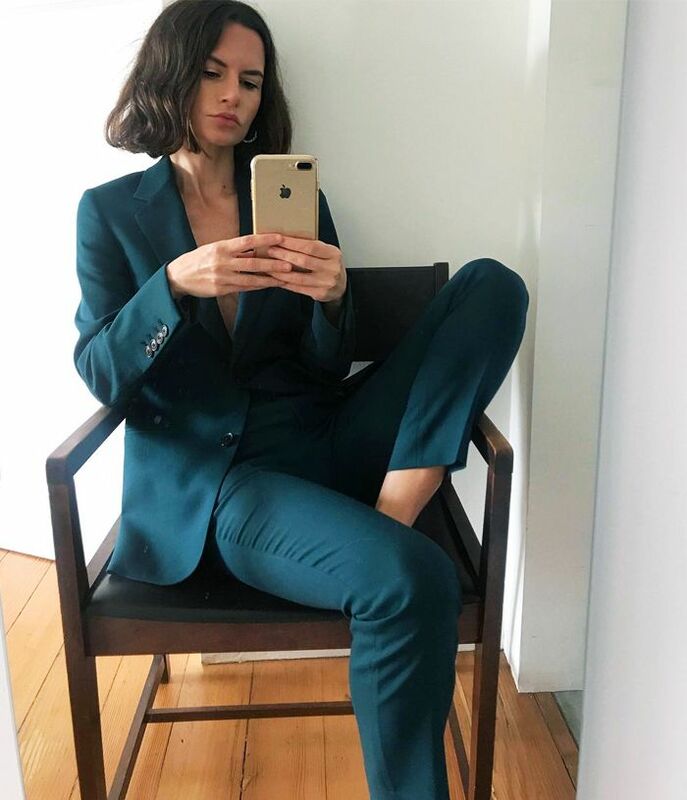 Milgrom explains: "This can be from a menswear brand to wear to work with a man's shirt and high-waisted fitted dark jeans—French girls have many dark blue or black versions. I'm currently styling my jacket with a Gucci belt." "If you need to walk, flat sandals are so practical. They can also update an evening look, such as a long dress so that it is both sophisticated and cool," says Milgrom. While French girls have jeans in a host of different washes, more than anything right now, it's about the silhouette rather than the finish. She's prioritizing a tailored cut: "They go with everything. You can go to work and then just change your top—a lingerie-inspired Caraco or a sequinned top—add high-heeled sandals, and you're ready to party," Milgrom tells us. We've often noticed French girls belting supersized sweaters over everything from skinny jeans to floral skirts, but now we know where they buy them. Milgrom recommends Uniqlo or Pringle of Scotland, and she'll employ one "to stay cozy on a weekend, paired with flared jeans or cashmere jogging pants. I have a collection of different colors, and I usually wear light or bright colors, rather than black." "It can be monochrome or a print, and I have many sleeveless versions that I love to style them with a belt, large or very thin high heels and my leopard coat," says Milgrom. French girls are keen on their classic leather jackets, Milgrom confirms: "The biker is a classic piece. I pair it with a long dress to give it a more urban and modern look. And also to go to work with a pair of jeans and a light cashmere sweater." The rule here? There are no rules, aside from the fact that the shoes need to be black and have stiletto heels. "You can go from classic ones to more daring styles such as conical heels," suggests Milgrom. Trust a French girl to know the best place to buy tailored shirts that fit perfectly. Milgrom highlighted the brand Charvet: "Parisian girls are effortless and love to dress in their boyfriend's essentials such as a shirt or a sweater worn a bit oversize." Now here's the item that really surprised us. We always imagined leopard-print cover-ups to be more of a British signature. Milgrom set the record straight: "It's a classic piece in every Parisian girl's wardrobe. We wear it as a part of a totally black look; it's so easy. A black sweater, black pants or black jeans and flat shoes to go to work with or a little black dress and high heels to go out in the evening. Usually, when I'm wearing my leopard coat, I'm not wearing makeup; this is my advice: Stay natural or just put on some red lipstick, and that's it." So it's plain to see that French girls rely heavily upon outerwear. We probably all have a trench coat somewhere, but Milgrom explains the specifics for her nation's chicest ladies: "It can be black or beige, always belted, collar up," she says. "It's effortless and convenient to cycle to work when you're wearing trousers. It's a great transitional piece. You can wear it with a warm sweater and a big, knitted scarf for winter, or with just a shift underneath when the weather starts to get warmer."